A small business can often find it hard to know which way to turn when looking for advice on how to make the most of its market. However, with a suite of online resources, Vistaprint is making sure it's on-hand for more than just business cards. Vistaprint began life when Robert Keane founded Bonne Impression in 1995. The Paris-based company started out as a direct marketer of desktop publishing software and specialist paper designed for laser printers. Realizing the company could increase revenue by using the products it was selling to create business materials such as business cards, brochures, and stationary, Keane changed the name to Vistaprint and switched to an online business in 1999. Today, the organization is wholly owned by Netherlands-based company Cimpress NV. The company's revenue has climbed 32% year-on-year, hitting $762 million in February 2018. Vistaprint has always promoted itself from a position of supporting small businesses - companies with ten or fewer employees. While this support is usually demonstrated via its product portfolio - which consists of affordable and good quality marketing materials and stationary - the company also provides an impressive suite of free advice via its online resources. 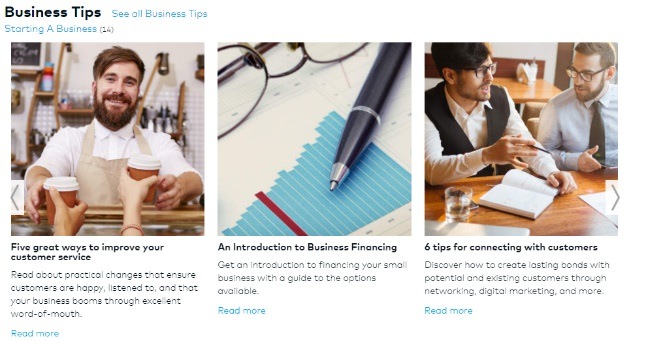 The Ideas and Advice section of Vistaprint's website has a ton of articles and information to help small business owners with everything from customer service and merchandising, to finance and branding. The advice is available in a range of formats from blog posts and articles to videos and infographics, and seeks to address the specific needs and challenges frequently encountered by small businesses. "On our Ideas & Advice page, we typically share tips that help small businesses better meet their goals," said Vistaprint CEO, Trynka Shineman, in a blog post. "We learn these lessons by listening to business owners and sharing what we've learned from the community that we serve. Starting a business takes tremendous guts - sometimes our customers are taking a risk financially, while others are put in a position to do things that they've never done before and have to make decisions in areas where they don't have enough information or a lot of experience." Another great online resource Vistaprint provides for its customers, completely free of charge, is its innovative PunchList webapp. With PunchList, small business owners are invited to share information about their company, such as the industry in which it operates, how long ago it was started, growth details, customer demographics, and more. PunchList then uses this data to construct a list of personalized marketing strategies which the business can use to achieve its specific goals - including information pertaining to how much time, cost, and effort may be involved in putting these strategies into practice. "[We face] the challenge of running a seasonal business in a small town but received some new marketing ideas from PunchList that we've started using," said small business owner Shawn Reilly, one of the early adopters of PunchList, when the tool launched in September last year. "I think it's great! I've been looking for ways to improve my marketing in a very small town which also happens to be a seasonal economy, so winters are very slow. Having a helping hand like this is a huge benefit!" Vistaprint has also developed its own PunchList skill app for Amazon's Alexa which small business owners can install to get daily marketing advice through the room assistant technology. Starting a small business can be a daunting prospect even for confident people. With so many plates to keep spinning and things to consider, it's easy to quickly become overwhelmed. However, by making a range of helpful resources available for free, Vistaprint not only helps small business owners keep their heads above water, but also establishes itself as a thought leader and trusted authority in its field. The final word goes to Bridget O'Brien, Vice President of Marketing at Vistaprint. "Business owners have to wear so many different hats. Helping small and micro businesses achieve their goals is extremely important to us and is a role we take seriously. This is why we continue to adapt to their needs, adding offerings such as the Ideas and Advice site and PunchList that provide relevant marketing advice for business owners. We'll continue to adapt both resources as we get feedback from customers to make sure we're meeting their needs." You can hear Cimpress NV Vistaprint's Senior Vice President of Customer Experience, Jonathan Habeski, speak at eTail East 2018 this August at The Sheraton, Boston, MA.